Popular Front columnist and New Deal propagandist. Fearless opponent of McCarthyism and feared scourge of official liars. Enterprising, independent reporter and avid amateur classicist. As D. D. Guttenplan puts it in his compelling book, I. F. Stone did what few in his profession could—he always thought for himself. America's most celebrated investigative journalist himself remains something of a mystery, however. Born Isidor Feinstein in Philadelphia, raised in rural New Jersey, by the age of twenty-five this college dropout was already an influential newsman, enjoying extraordinary access to key figures in New Deal Washington as well as the friendship of important artists in prewar New York. 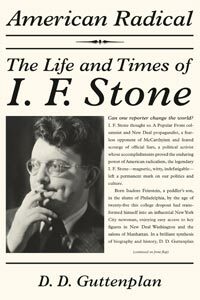 It is Guttenplan's wisdom to see that the key to Stone's achievements throughout his singular career—not just in the celebrated I. F. Stone's Weekly—lay in the force and passion of his political commitments. Stone's calm, forensic, yet devastating reports on American politics and institutions sprang from a radical faith in the long-term prospects for American democracy. His testimony on the legacy of American politics from the New Deal and World War II to the era of the civil rights struggles, the Vietnam War, and beyond amounts to as vivid a record of those times as we are likely to have. Guttenplan's lively, provocative book makes clear why so many of his pronouncements have acquired the force of prophecy. D. D. Guttenplan, The Nation's London correspondent, is the author of The Holocaust on Trial: History, Justice, and the David Irving Libel Case, and is an award-winning former writer for Newsday. His essays have appeared in many American journals and newspapers. "[W]hat makes the book outstanding is Guttenplan's sense of Stone's brand of skeptical, independent radicalism as shaped by larger movements … Guttenplan's book is a colorful, rambunctious left-of-center American cavalcade." "[The book] makes a strong case for Stone’s continuing relevance to our own time." "D.D. Guttenplan … offers a vividly written, avidly researched biography." "Prodigious research and a grateful heart inform this essential biography of an irreplaceable journalist." "A lively portrait of a journalist who was as passionate about radical politics and getting a story right as he was about ballroom dancing . . . Guttenplan's lively biography brings back to life a man whose work has often been forgotten but whose writing and life provide a model for the kind of freethinking journalism missing in society today." "This is the right book at the right time from the right author. The right book, because IF Stone remains one of the great American voices, whose words still catch fire all these years later. The right time, because in the age of Obama liberals the world over are once again looking to the United States as a source of progressive inspiration. And the right author, because D.D. Guttenplan has that rare ability to combine scholarly rigor with an eye for a cracking human story-and the talent to tell it." "Don Guttenplan's brilliant biography of I. F. Stone is a wonderfully vivid portrait of a courageous journalist who exposed the follies of American policy in Vietnam. It is also an acutely observed, clear-eyed account of the dilemmas faced by the American Left from the days of the Popular Front, through the McCarthy era, to the challenges of the civil-rights movement and the New Left, giving us an indispensable analysis of the strengths and weaknesses of American radicalism."